Tyree Cooper is one of the originators of Acid House, pioneering the sound back in the 80´ies from Chicago through various hits on the underground label DJ International. More recently one of his big hits ‘Turn up the Bass’ was re-released on Epic and his own label Supa Dupa Recordings with remixes. Ben Sims is known for his trademark funky/ tribal Techno but Acid is one of his favorite styles and he even puts on Acid parties in London himself sometimes. He’s looking forward to playing a real acid set on Retro Acid. Next to this extravaganza, we also bring you Belgian topper X&Trick, the leading force behind the Bug Klinik label and parties next to numerous others events. Bugklinik recently expanded with a web-label and booking-agency and X-trick is also working on new projects such as Endiku. He’s currently also playing all the biggest and best experimental festivals in Europe. 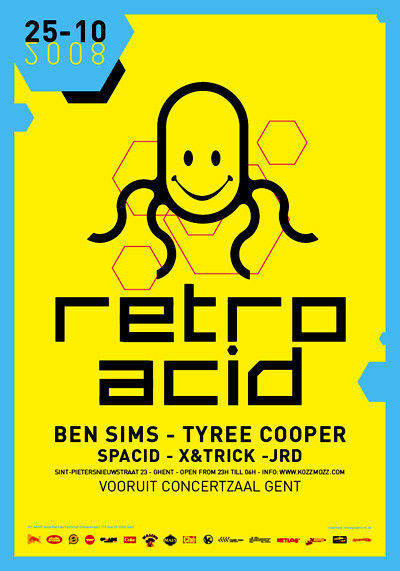 JRD, based in Antwerp, originally from Holland, got interested in dance music when New-beat and Acid-house was introduced. Since than he has been playing records and experiencing the evolution of electronic dance music. He’s the founder of the Dutch Resistance-concept in Antwerp and one of the resident powers at Technoir and Metrotechno. This night he will go back to the start, 20 years ago, 1988, Acieeeeed ! Acid in the house !!!!! !